The European Commission in Brussels has approved without conditions the merger of Random House and Penguin Group. The merger has already been approved by regulators in the U.S., Australia and New Zealand and is still being reviewed in several other countries, including China and Canada. Under the merger, which was announced last October, Bertelsmann, owner of Random House, will own 53% of Penguin Random, and Pearson, which owns Penguin, will own 47%. 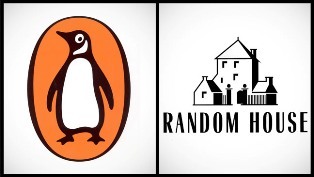 The merged company will include all of Random House and Penguin Group's publishing units in the U.S., Canada, the U.K., Australia, New Zealand, India and South Africa, as well as Penguin's operations in China and Random House's publishers in Spain and Latin America. Bertelsmann's German publishing group, Verlagsgruppe Random House, is not included in the merger. 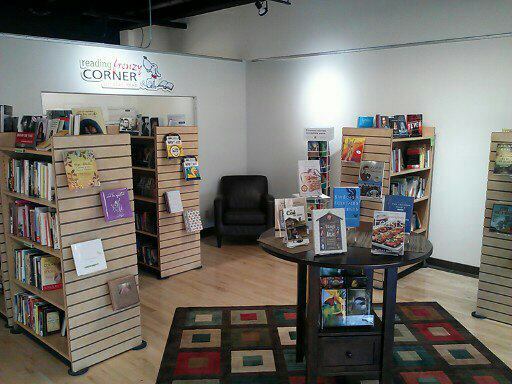 Reading Frenzy Bookshop, Zimmerman, Minn., has opened its branch in the new Elk River Area Arts Alliance Building in Elk River. The store will have its grand opening on Saturday, April 20, which will feature an event with Eric Dregni, author of Vikings in the Attic: In Search of Nordic America and In Cod We Trust. His appearance is, said owner Sheri Olson, an example the kind of tie-ins she wants to do with the Arts Alliance, which has an exhibit this month from the American Swedish Institute. 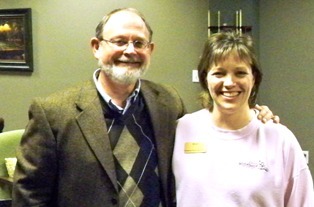 Author William Kent Kreuger with Reading Frenzy owner Sheri Olson. Last Friday Reading Frenzy hosted its first author event, for William Kent Krueger, whose new book is Ordinary Grace. In an auspicious debut, the event was sold out, Olson said. 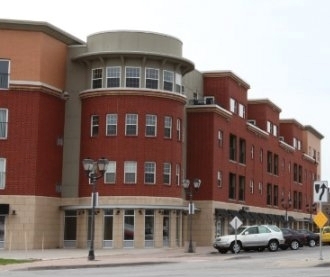 As noted by the Star News, Olson plans to hold "town picnics and author grillings" this summer on the 3,000-square-foot patio outside the Elk River Arts Alliance building, in conjunction with weekly concerts in the Rivers Edge Common Park, about two blocks away. "I'll be combining my efforts with what's already going on and what will be going on to provide a match," Olson told the paper. "I think we can help each other. It's a win-win for the Arts Alliance and us. We hope to bring people through their doors." She added that the meals will be inexpensive, and "each week we'll have a different author signing their books and talking with the crowds." The concerts draw an average of 500-600 people, with 1,500 for the big acts. 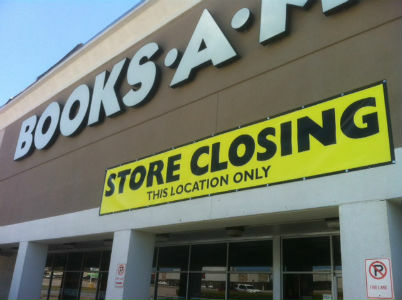 The Books-A-Million on Skyland Boulevard in Tuscaloosa, Ala., is closing on May 18, WBRC-TV reported. The store opened 20 years ago. BAM commented: "We do routinely evaluate each one of our retail locations, and at this time we've chosen to close this location. We are actively looking for other real estate opportunities in the market." The closing sale began over the weekend. Independent bookstores working with Kobo sold more e-books in the first month of the Kobo-ABA partnership than they did in more than two years in a similar partnership with Google, the ABA told Digital Book World. A main reason is because the partnership includes the sale of Kobo e-readers and tablets, not just e-books. Some 460 bookstores have signed up for the program, more than ever signed up with Google, and Kobo expects to have 1,000 by the end of the year. The sales numbers are, however, modest. Among stores surveyed by DBW, Books, Inc., in the Bay Area, has sold 300-400 e-books as well as 200 e-readers at its dozen stores; Harvard Bookstore in Cambridge, Mass. has sold "a couple hundred" e-books; Greenlight Bookstore, Brooklyn, N.Y., has sold about 100. At the bottom of the range is Alexander Book Co., San Francisco, which has sold no e-books (despite selling more than a dozen e-readers). Margins are modest, too: 5% on Kobo devices and 8%-20% on e-books, depending on Kobo discounts and promotions. But most booksellers are glad to be able to offer e-books and e-devices to customers. Derek Harmening of the Book Cellar in Chicago spoke for many of them when he said, "E-books aren't going away, and it's nice to know we have an alternative to the Nook and Kindle, something that can bring people back to a community store." ABA member technology director Neil Strandberg added, "We absolutely think that ABA members need an e-book and e-reader option. What's important here is that we do not alienate customers who want to read digitally. The success of the program cannot only be measured in e-book sales but in retaining and serving the needs of our customers." 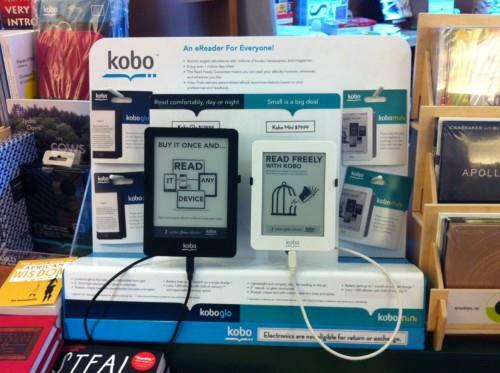 Now there is another twist: Kobo is selling its devices directly from its website in the U.S. and Canada, a change in Kobo's traditional model of selling them through retailers--and one that that has perturbed some booksellers. 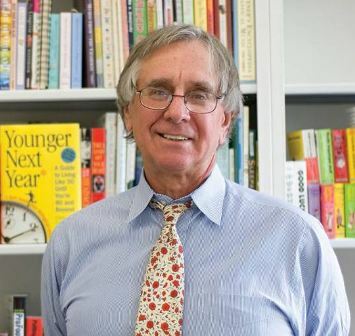 Peter Workman, founder, president and CEO of Workman Publishing Company, died yesterday of cancer. He was 74. After working in the sales department of Dell Publishing, he founded Workman in 1967 as a book packager. Within two years, Workman published its inaugural list, highlighted by Richard Hittleman's Yoga 28-Day Exercise Plan. Among its bestsellers are B. Kliban's Cat, The Official Preppy Handbook, The Silver Palate Cookbook, What to Expect When You're Expecting, the Brain Quest line, Sandra Boynton's children's books and 1,000 Places to See Before You Die. In 1989, Workman Publishing bought Algonquin Books of Chapel Hill and, later, acquired Storey Publishing, Timber Press and HighBridge Audio. In 1994, Workman Publishing launched Artisan, and it distributes Black Dog & Leventhal, Greenwich Workshop Press and the Experiment. The company noted that Workman was "a passionate golfer and skier and a keen poker player, and he took great pleasure in the company of friends, colleagues, and family" and that he was "moved by the beauty and expanse of nature--Yosemite, Zermatt, Patagonia, the heaths of Scotland. He was a man driven by big, innovative thoughts. And yet, when it came to bookmaking, he paid attention to the smallest detail: the size of a folio, the use of an ampersand, the quality of paper. A visionary, an inspirational leader, and true friend, Peter will be deeply missed." The company will be run by Workman's wife, Carolan, his daughter Katie and "the small management team of people who have been a mainstay of Workman's success over the years," Carolan Workman wrote two weeks in a memo about Bob Miller's departure as group publisher. 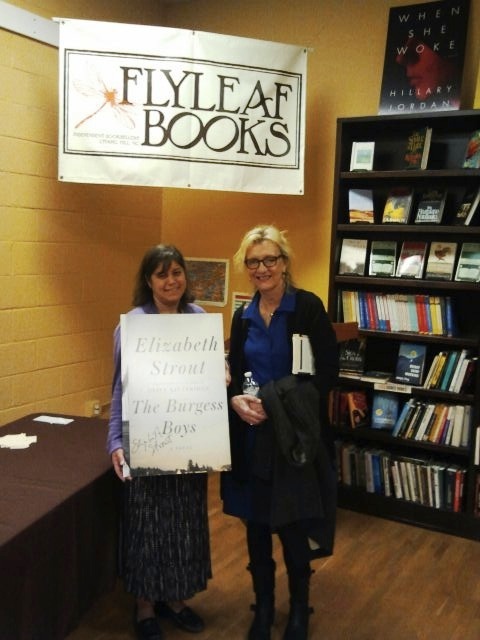 Yesterday, Flyleaf Books, Chapel Hill, N.C., and the Orange County Literacy Council sponsored an event featuring Elizabeth Strout, whose latest novel is The Burgess Boys. Strout had a spirited and entertaining conversation about her writing life and novel with surprise interviewer, friend and fellow author Daniel Wallace ("I'll try to talk about the book, but he's hopeless and I'm helpless, so...," she joked). A portion of the proceeds for the ticketed event, which drew approximately 100 fans, was donated to the OCLC. Pictured are Flyleaf owner Jamie Fiocco and Strout. The Wall Street Journal discussed several bookstore book clubs for young readers in the New York metropolitan area, a trend it called "one of the latest weapons being employed by independent bookstores as they stake their ground against the online giant Amazon and the rise of e-books.... The booksellers hope to pass on a love of reading and to capture the youngsters' loyalty early, before they enter high school with its competing demands of sports and other after-school activities." 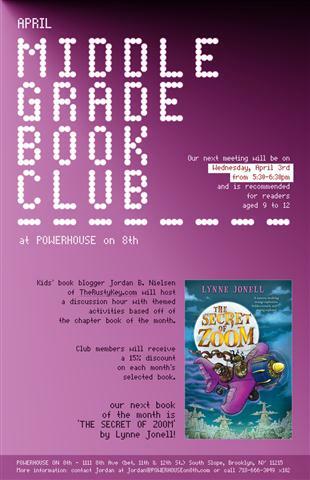 "We're definitely trying to foster a community spirit and establish a presence in the neighborhood as a place where kids can come and get engaged with the reading material," said Jordan B. Nielsen, a children's book blogger who recently started a club for children 9-12 at the new branch of Brooklyn's powerHouse Arena, powerHouse on Eighth Avenue, in Park Slope. Watchung Booksellers in Montclair, N.J., has a book club for boys, who are happy, said the current club leader, to have an alternative to sports and enjoy meeting at the bookstore. Targets of Revenge by Jeffrey S. Stephens (Gallery Books). This morning on Good Morning America: Carol Burnett, author of Carrie and Me: A Mother-Daughter Love Story (Simon & Schuster, $24.99, 9781476706412). She will also appear tonight on Entertainment Tonight and tomorrow on the View and Access Hollywood. This morning on MSNBC's Morning Joe: Cass R. Sunstein, author of Simpler: The Future of Government (Simon & Schuster, $26, 9781476726595). He will also appear on today NPR's Marketplace and PBS's Nightly Business Report and tomorrow on CNN's Starting Point. Today on Fox Radio's Kilmeade & Friends: Mike Piazza, co-author of Long Shot (Simon & Schuster, $27, 9781439150221). Tomorrow he'll be on CBS Sport's Jim Rome Show. Today on NPR's Diane Rehm Show: Adam Grant, author of Give and Take: A Revolutionary Approach to Success (Viking, $27.95, 9780670026555). Today on PBS's Tavis Smiley Show: Jared Diamond, author of Collapse: How Societies Choose to Fail or Succeed: Revised Edition (Penguin, $18, 9780143117001). Tonight on Coast to Coast AM: Joseph Gallenberger, author of Inner Vegas: Creating Miracles, Abundance, and Health (Rainbow Ridge, $18.95, 9781937907105). Tonight on the Daily Show: David Stockman, author of The Great Deformation: The Corruption of Capitalism in America (PublicAffairs, $35, 9781586489120). Tomorrow morning on CBS This Morning: Paul Anka, co-author of My Way: An Autobiography (St. Martin's Press, $29.99, 9780312381042). Tomorrow morning on Good Morning America: Daniel Humm and Will Guidara, authors of I Love New York: Ingredients and Recipes (Ten Speed Press, $50, 97816077144405). Also on Good Morning America: Mary Williams, author of The Lost Daughter: A Memoir (Blue Rider Press, $26.95, 9780399160868). She will also appear on Current's Joy Behar Show. Tomorrow morning on the Today Show: Jill Smokler, author of Motherhood Comes Naturally (and Other Vicious Lies) (Gallery, $15, 9781476728346). Tomorrow morning on NPR's Morning Edition: Mark Mazzetti, author of The Way of the Knife: The CIA, a Secret Army, and a War at the Ends of the Earth (Penguin Press, $29.95, 9781594204807). He will also appear on CNN's Situation Room, PBS's Newshour and Charlie Rose. Tomorrow on Access Hollywood: Tom Sizemore, author of By Some Miracle I Made It Out of There: A Memoir (Atria, $26, 9781451681673). Tomorrow on NPR's Diane Rehm Show: Dan Jones, author of The Plantagenets: The Warrior Kings and Queens Who Made England (Viking, $36, 9780670026654). Tomorrow night on the Colbert Report: Charlie LeDuff, author of Detroit: An American Autopsy (Penguin Press, $27.95, 9781594205347). Tomorrow night on the Late Late Show with Craig Ferguson: Debbie Reynolds, author of Unsinkable: A Memoir (Morrow, $28.99, 9780062213655). For its April Book of the Month, the German Book Office has chosen Anton and the Battle by Ole Könnecke, translated by Catherine Chidgey (Gecko Press, $17.95, 9781877579264). The GBO commented: "This imaginatively illustrated children's book portrays a common episode of boyhood (and girlhood): the epic battle between friends. Könnecke has chosen a style akin to that of Crockett Johnson, author of Harold and the Purple Crayon, and does it well. "Anton and Luke star in this picture book battle. Both claim to be the strongest, but will they be proven wrong by a puppy?" Könnecke, who is a freelance illustrator, has published several Anton books, including Anton and the Girls, Anton Can Do Magic and Anton's Secret. Chidgey is a novelist and short story writer whose first novel, In a Fishbone Church, won several awards and was a bestseller in New Zealand. The aftermath of catastrophe forms the backdrop of Claire King's debut novel, The Night Rainbow. In a village in southern France, five-year-old Pea's pregnant mother, already reeling from the loss of the baby that preceded this pregnancy, is grieving the recent loss of her husband. Pea's mother withdraws to her room and the house is perpetually in shambles. It is in this oppressively sad atmosphere that Pea and her younger sister, Margot, alternate between trying to hold the house together and playing games for hours in the nearby meadow. There they meet Claude, a neighbor with a mysterious past. Told entirely from Pea's perspective, The Night Rainbow is dominated by her imaginative and precocious voice--and limited by her narrow understanding of events. Readers may be reminded of Mark Haddon's The Curious Incident of the Dog in the Night-time, another novel in which a young narrator bears witness to events and character interactions that must be interpreted by the reader. This approach compels the reader to work to understand the story, especially as it gradually becomes clear that Pea's presentation is severely distorted--both by her age and by her own significant pain in the face of grief. Pea constantly describes a "darkness" filling her that she can't otherwise understand, which the reader can recognize as her feelings of abandonment and need for attentive parenting. It is this need that draws Pea to Claude, whom she seeks to make her new Papa. One of the most remarkable features of The Night Rainbow is the language, shaped entirely through Pea's perceptions. The children's powerful imagination and cleverness define the narrative, as in Margot's description of death: "Then you stop talking and then you are a skeleton and then there is a big party with sandwiches, but not as much cake as at Christmas." The dialogue between Pea and Margot is often poetic, gaining in symbolic significance as the truth behind Pea's misperceptions of the world become more apparent to the reader. Shelf Talker: A story of profound grief told in poetic language, through the eyes of a child in a small village in southern France. 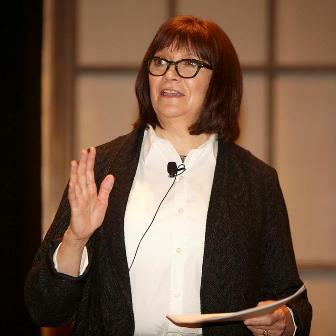 At Friday's inaugural SLJ Public Library Leadership Think Tank, Rebecca Miller, editor-in-chief of School Library Journal, set the tone with her theme of collaboration. 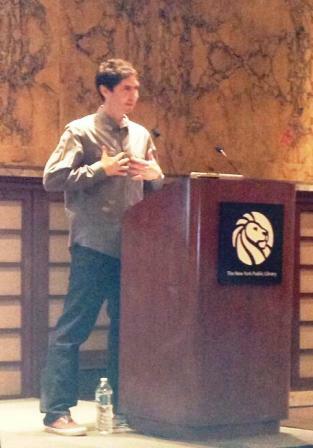 The ideas raised among the public librarians--attendees from New York City to Washington State--at the New York Public Library's flagship Fifth Avenue branch will be carried into SLJ's fall summit. It was a day of conversation about partnerships, between public librarians, school librarians and community leaders, and tips on how to make it happen. "If libraries were tree houses..." began Pamela Sandlian Smith, director of Anythink Libraries in Colorado. She took a seemingly abstract topic and made it a reality, with airy, light-filled spaces populated with "museum quality" trees as reading rooms and "experience zones" where patrons could watch chicks hatch or view an art exhibit with sound effects. Anythink Libraries hosts a Tech Fest day, for everyone from shelvers (or "wranglers," as Smith calls them) to library staff to board members, in which they learn from local experts how to make and edit videos and animated shorts and other projects, then teach their patrons in turn. Smith said she went to her boss with her top 10 goals. He said it might take them 10 years to get there, but he was on board. "If he'd said no," Smith said. "I would have left." What about the naysayers, someone asked. "You'll always have 6%-7% who are grumpy," said Smith. "Listen to your innovators. They drive the bus." Moderator Daryl Grabarek (far r.) and panelists Kathy Bennett, Nicholas Higgins, Susan Modak, Rachel Payne. Next up was a panel of innovators: Kathy Bennett, a Library Lead teacher from Metro Nashville Public Schools; Nicholas Higgins, associate director of community outreach for NYPL; Susan Modak, Montgomery County Public Libraries in Maryland; and Rachel Payne, coordinator of Early Childhood Services at Brooklyn Public Library in New York. Payne talked about the importance of "branding"--how, for example, changing her program from "Saturday Storytime" to "Ready, Set, Kindergarten" increased attendance by 30% and led to a collaboration with the Department of Education. "Match your mission to the potential partners," Higgins said. "Approach it like a job interview." Payne fine-tuned Higgins's point: "I went from 'I want to work with that organization,' to 'I want to work with that person.'" Bennett forged a lending program and courier system permitting public libraries to lend to school libraries. This helped schools meet the Common Core Standards with a broader array of literature and resulted in an increase of 5,500 elementary school students and 17,000 first-time users at public libraries overall. Lynn Lobash, manager of strategic projects at NYPL, also discussed outreach to New York public schools, only 56% of which have a librarian. MYLibraryNYC is a program to convert school IDs to public library cards. They have a shared catalogue, with the school library collection as the main page and the public library catalogue as a sidebar whenever someone conducts a search in a school. 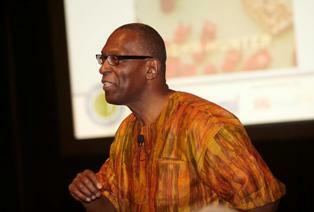 Collaborations among students emerged as the theme in John Hunter's inspiring keynote. As a teacher and the architect of the World Peace Game, Hunter wrote World Peace and Other 4th-Grade Achievements (just out from HMH). He lays out 50 complex interlocking global problems and a four-tier, 4'x4' Plexiglas structure representing the planet, and a room full of fourth-graders must reach a shared goal of achieving world peace. "There's no way [the game] can be won by a single person, but I don't teach them that. They learn by engaging in the process," explained Hunter, who gave a TED Talk about his innovative game, which is also the subject of a documentary (with the same name as his book). He noted that the troublemaker is often his best student, with skills worth leveraging. "If you can touch the heart, the mind contact goes deeper," Hunter said. At the breakout "Think Tank" session on Common Core Standards, the focus was on assuaging the fears of teachers and parents, directing them to books that inspire critical thinking. The Think Tank Apps group stressed the need for balance among apps, e-books and print books; because most kids bring in their own devices, the budget can be shifted away from devices and toward content. The Rethinking Spaces group suggested "designated spaces"--not necessarily permanent and flexible for the needs of the project you're bringing to the community. The "Librarians Wild" group offered strategies that could be applied to many of the groups. "Find out who's doing what you want to be doing"; "Let people say what makes them uncomfortable," then figure out how to work through that; "Focus on what you can do and build on successes"; "Accomplish things as a group, so you have a succession plan."